After the Second World War Poland was free of German occupation, but, with the consent of its Western Allies, was left under the yoke of Russian Communism. The Polish forces which fought under allied command could not return home to Poland, as their country did not enjoy the freedom and independence they had fought for. On Stalin’s insistence the Polish soldier was not allowed to take part in the Victory parade in 1946. The Polish Government in Exile remained in London until 1990 in order to oppose the Communist aggressor. Thus, for 45 years, the Polish nation had to suffer from an alien Communist system, being exposed to terror and murder. The extermination of the representatives of the Polish Government residing in London and members of the Home Army was ex­ceptionally brutal. The losses Poland suffered during the reign of terror under both the German and Soviet occupations were very high. Over 6 million citizens perished in German hands and about 2 million perished in Soviet labour camps and various places of execution, including Katyń. Poland’s military contribution to the Allied victory over Germany is presented in this pamphlet by an historian, Andrzej Suchcitz, and is published by the Ex-Combatants Association in Great Britain, a veteran organization of men and women who contri­buted to the Allied victory. It is hoped that the historical account, by necessity being short, will be a further and valued contribution to the understanding and evaluation of all that was achieved by the participation of our generation in the 2nd World War. 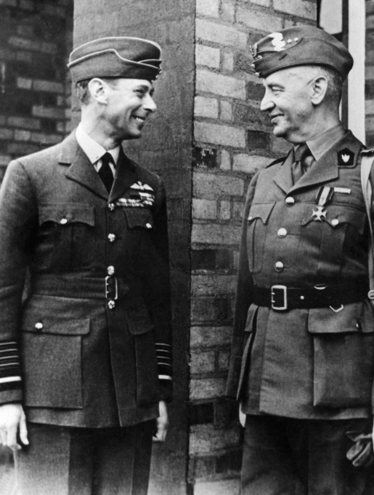 King George VI and Gen. Władysław Sikorski – Polish Prime Minister and Supreme Commande-in-Chief 1939-1943. On 1 September 1939, Europe was plunged into a second devastating world war, barely 21 years after the ending of the first one. It began with Germany’s invasion of Poland. 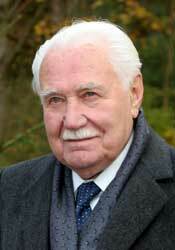 For Poland, it was the beginning of a nightmare which was to last not for 5′/2 years but nearly half a century. During the whole war the Polish nation with its President and Government at its head, refused to lay down arms, or surrender and accept for one moment the tem­porary occupation of the country by its two neighbors. The Polish Campaign of September and early October 1939 was the first round between the Axis Powers and the Allies. Outflanked on three fronts (northern, western and southern), outnumbered by a better equipped army, the Polish Armed Forces put up a desperate fight for their country, falling back on successive lines of defense. The Polish defense plan was based primarily on a coalition war, in accordance with the terms of the French and British alliances then in force. The Polish High Command saw its task as one of carrying out a delaying action, holding the German advance and falling back under pressure, thus giving time for the French Army to attack in the west against the barely defended Siegfried Line Meanwhile, French and British bombers were to strike at military targets within Germany itself. Whilst the Polish armies were reeling under the weight of the German onslaught, the guns remained silent on the western front. Poland mobilized 39 infantry divisions, 3 mountain brigades, 2 motorized armored brigades, 10 cavalry brigades, artillery, engineers and other specialized formations. Despite strong resistance along the frontier, the Polish defense lines were broken by powerful enemy panzer formations, Mean­while the Luftwaffe bombed military and civilian targets deep behind Polish lines, terrifying fleeing refugees and battering retreating army columns. Despite the havoc created, the Polish armies managed to extricate themselves and though sustaining heavy losses, managed to reach the Vistula on 6 September. This defense line, too, was soon broken through. The Polish C-in-C Marshal E. Smigły-Rydz ordered a withdrawal of Polish forces in a south-easterly direction, so as to establish a defense redoubt backing onto allied Romania, through which supply transports were expected. Here, the Polish forces would await the allied offensive and according to the development of events, return to offensive operations as the pressure eased off. Meanwhile, the Polish armies fought a series of bloody battles, the largest and most important being the battle of Bzura 9-21 September 1939, when the combined forces of Armies ,,Poznan” and ,,Pomorze” under Gen. Kutrzeba counter-attacked against the flank of the German 8th Army attacking Warsaw. Early attempts by the Germans to capture Warsaw on 8 September were repulsed leading to the siege of the Polish capital lasting until 27 Septem­ber. The city of Lwow was similarly besieged between 12 and 22 September, and finally surrendered to the Soviets. The Polish naval base at Hel held out until 1 October, whilst the Independent Operational Group ,,Polesie” under Gen. F. Kleeberg fought the last battle of the Campaign at Kock, laying down its arms only when ammunition ran out on 5 October. On 17 September 1939 with the Polish armies fully engaged against the German onslaught, the USSR invaded from the East. The Frontier Defense Corps and improvised forces in eastern Poland put up a spirited if futile struggle, including the two-day defense of Grodno, the battles of Kodziowce and Szack. The Soviet invasion put paid to any chance of maintaining the Roma­nian bridgehead. The Polish President, Government and Supreme GHQ were forced to cross the border into allied Romania, with the aim of reaching France and from there continuing the war against the two invaders Under political pressure from Berlin, the Romanian government interned the Polish President, Govern­ment and High Command. The Polish Campaign had lasted 6 weeks. The German losses were: 16,000 killed, 32.000 wounded, 674 tanks, 319 armored trucks, 195 guns and mortars, 6,046 trucks and 5,538 motor­cycles were destroyed or badly damaged. The Luftwaffe lost 564 airplanes and the Kriegsmarine one minesweeper. The Red Army’s losses amounted to 2,500 killed, 9,000 wounded, 1,000 taken prisoners, 150 tanks and armored vehicles and 15-20 aircraft destroyed. On 30 September 1939,in Paris, a new Polish Government under Gen. Władysław Sikorski was sworn in by the newly appointed President Władysław Rzaczkiewicz. On 7 November Gen. Sikorski wasl also appointed C-in-C of Polish Armed Forces. Many Polish soldiers and civilians made their way to Syria and France via Romania and Hungary, flocking to join the Polish Armed Forces in the West. By May 1940 there were 84,500 men under arms in France and Syria. In April 1940 the Independent Podhalańska Rifle Brigade was sent to Norway, as part of the Allied effort to help that country. The Brigade distinguished itself in the battle for Narvik only to be evacuated on 6/7 June back to France. Meanwhile, the 1st Grenadiers Division and 2nd Infantry Rifles Division were sent to support the French forces on the Maginot Line. The 1st Grenadier Division fought at Lagarde on the Rhine-Marne Canal, carrying out a stubborn withdrawal. Surrounded by the enemy its commander ordered its disbandment and its soldiers to escape to Britain. The 2nd Infantry Rifles Division covered the withdrawal of 45 French Corps at Belfort in Alsace. Already cut off by the advancing Germans, the 45 Corps and 2nd Rifles Division fought at Clos du Doubs, with the Polish division backing on to the Swiss frontier. After heavy fighting on 18 and 19 June the French commander of 45 Corps decided to withdraw to Switzer­land, where the French and Polish soldiers were interned. At Montbard, the 10th Armored Cavalry Brigade repelled for a brief while the German units which had occupied it (16 June). In earlier fighting, the Brigade had prevented French divisions from being prematurely cut off, allowing them to withdraw. Following the taking of Montbard by 10 ACB the Germans blew up the bridges on the Burgundy Canal. Isolated and surrounded. Gen. Maczek disbanded the Brigade and ordered the troops to try and reach Britain. With France collapsing all around, the as yet not fully organized 3rd and 4th Polish Infantry Divisions were pressed into action taking part in the doomed defense of the Brittany redoubt around Rennes, and the evacuation from La Rochelle. Unlike the Polish Government in September 1939, the French Government decided that France should lay down her arms and capitulate to Germany. 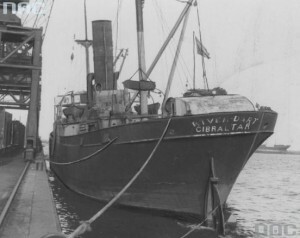 The remnants of the Polish Army made their way to the Atlantic ports Of the 84,500 personnel only about 24,000 were saved and evacuated to the UK. The Polish Government and High Command established their temporary headquarters in London and set about rebuilding the Polish Armed Forces for the second time. The Polish Army was located in Scotland in the summer of 1940 and this was to remain its base in the UK until the end of the war. Organized Into the 1st Corps, its units were earmarked for the defense of Fife in the event of an expected German invasion from Norway The Corps became the base on which the 1st Armored Division, the 1st Independent Parachute Brigade, the 4th Infantry Division and 16th Independent Armored Brigade were formed. Additionally many of the military training, educational and research institutions were located in Scotland. Between 1940 and 1943 the Poles manned 12 armoured trains as part of the defence of the British Isles, stationed in Scotland as well as North East England, East Anglia and Cornwall. In the meantime, the trickle of escapees reaching Syria led in April 1940 to the formation of the Independent Carpathian Rifle Brigade, which in July 1940, after refusing to accept France’s capitulation, crossed from French Syria to British ruled Palestine. Under its commander Gen. S. Kopahski, it took part in the defense of besieged Tobruk, August 1941 — December 1941, defending the heavily attacked western perimeter. After the lifting of the siege, the Brigade broke through the enemy positi­ons at El Ghazala enabling the 8th British Army to renew its offensive against Rommel. The Brigade, seriously under strength, was withdrawn in March 1942, at the same time as the first evacuation of the Polish Army in the USSR was about to begin. On 22 June 1941 Germany invaded her erstwhile ally, the USSR. On 30 July 1941 the Polish Government in London signed the Polish-Soviet Agreement, which despite its serious drawback of not guaranteeing Poland’s eastern border, did lead to a resumption of diplomatic relations and provided for the release of all deportees. From a military point of view it provided for the formation of a Polish Army, which whilst under full control of the Polish Government would be operationally subordinated to the Soviet High Command, and fight on the eastern front. However Soviet perfidy did everything to sabotage the smooth development of bilateral relations. It soon became apparent that if the lives of those released were to be saved they had to be evacuated to the Middle East. Eventually in two large-scale evacuations in March and August 1942, 114,000 soldiers and civilians were transferred to Persia. This represented under 10% of all Poles forcibly deported to the depths of the USSR following the invasion and occupation of eastern Poland in 1939. The discovery of mass graves of Polish officers at Katyn in April 1943, murdered by the Soviet NKVD in spring 1940, provided the explanation for the glaring lack of officers arriving at the Polish army centres in the USSR during 1914 and 1942. Throughout 1942 and 1943 the Polish Army in the East underwent health rehabilitation following their ordeal in the Soviet camps, followed by intensive training and several reorganizations, preparing it for battle. For operations in Italy, the 2nd Polish Corps was formed composed of the 3rd Carpathian Rifles Division (incorporating the old Independent Carpathian Rifle Brigade), 5th Kresowa Infantry Division, 2nd Armored Brigade, Army Group Artillery as well as the necessary corps units, including the Polish Women’s Auxiliary Service. The 2nd Corps, under the command of Gen. W. Anders, landed in Italy in December 1943 and January 1944. As part of the British 8th Army, it took up defensive positions along the Sangro. Earlier the Polish Commando Company had been sent to Italy for special duties. The Corps’ combat route took it to the fourth battle of Monte Cassino (11-18 May 1944) which ended in the capture of the monastery hill by 2nd Corps, thus securing the opening of the road to Rome for the Allied forces. In July 1944 the battle of Ancona led to the capture of this important port by the Polish Corps. Further operations led in the direction of Pesaro along the Adriatic coast The Corps was then moved inland covering the British 8th Army’s flank in the Emilian Apennines. In January 1945 the Corps reached the river Senio. initiating three months of static warfare in preparation for the assault on Bologna, The offensive which began on 9 April led to the capture by Polish Forces of Imola on 15 April and Bologna itself on 21 April. The Corps was then withdrawn for recuperation the capture by Polish Force itself on 21 April. The Corps thus ending its war. 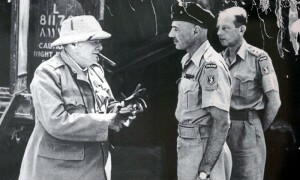 Winston Churchill, the British Prime Minister in conversation with Lt.-Gen. Władysław Anders, GOC 2nd Polish Corps. At the time 2nd Corps was fighting along the Gothic Line, the 1st Polish Armored Division, under its commander Gen. S. Maczek, landed in France on 1 August 1944 becoming part of the 1st Canadian Army in the 21st Army Group. In a series of operations, 1st Armored Division became the cork which closed the allied gap at Falaise, through which German forces were escaping eastwards. At Chambois-Mont Ormel the Division with­stood countless assaults by German forces trying to get out of the pocket. The Division then advanced through N.W. France and Belgium — liberating Ypres, Roulers-Thielt, participating in the clearing of Ghent, and the forcing of the Axel-Hulst Canal. Following the crossing of the Dutch frontier, the Division captured Baarle Nassau, forced the Mark Canal liberating Breda. During the winter, the Division held the river Maas line, preventing enemy infiltration and tying down his forces. The last operations took place along the Dutch-German frontier with the main fighting taking place along the Kusten Canal advancing on Moorburg and Westerstede before the final push to Wilhelmshaven, which was occupied by the Division after the German surrender. 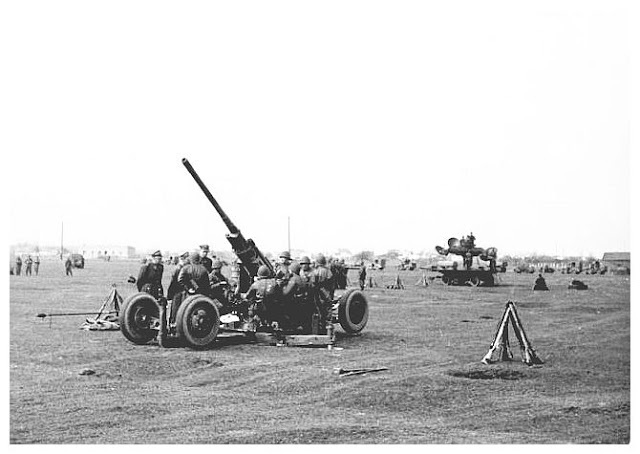 It remained as part of the occupation forces up to 1947. 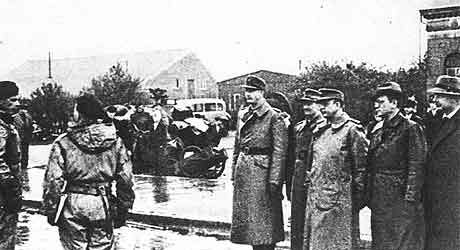 Col. Antoni Grudziński – representative of the 1st Polish Armoured Division, receives the capitulation of Wilhelmshaven – May 1945. In September 1944 the Polish 1st Independent Airborne Briga­de under Gen. S. Sosabowski, which had been formed in Scotland in 1941 with the aim of being used to assist the planned uprising by the Polish underground resistance — the Home Army, participated in Operation Market Garden during 18-26 September 1944, fighting at Arnhem-Driel and covering the British withdra­wal across the Lower Rhine (Lek). 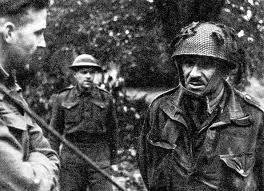 Gen. Stanisław Sosabowski GOC 1st Polish Independent Parachute Brigade in conversation with an officer of the Dorset Regiment, Holland – 1941. Polish Secret Army in France. Apart from the above mentioned operational-tactical formati­ons, Polish forces were also involved in the organization of an underground army in occupied France. Made up from those elements of the Polish Army which were not evacuated in June 1940, it formed a separate organization, based on cells, whose attack on the enemy was to coincide with the Allied landing. It also acted as an intelligence gathering network, and among its achievements was the pinpointing of 67 V-1 rocket launch pads, which were then bombed by the RAF. In southern France, Polish resistance units took part in the liberation of France either in independent groups or together with the Maquis. Throughout the war, various Polish military institutions such as the Military Institute of Technology, the General Staff Academy, the Intelligence School along with the many specialist army training centers prepared new cadres, devised new and better equipment including for instance many improvements in aircraft parts (e.g. bomb release gear which was mass produced by Vickers Armstrong), and radio equipment. The most important wartime invention by Polish specialists was the No.3 (Polish) mine detector which was subsequently used by the British Army. Polish military intelligence built up an extensive network throughout occupied Europe, providing invaluable information for the Allies regarding troop, aircraft and naval movements, giving warnings of the imminent German invasion of the USSR. This was in addition, to supplying the Allies with the secrets of Enigma, even prior to the outbreak of war, an act of generosity not reciprocated by either the British or the French as far as asdic or radar was concerned. 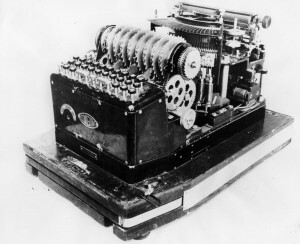 Arguably the single largest contribution made by the Poles to the Allied was in the initial breaking of the German Enigma code and presenting both the French and British with a complete working machine and all the documentation needed to continue working on the German codes. This act of generosity carried out in July 1939 was never reciprocated either by the British or the French. Neither were the Polish Enigma code breakers allowed to work at Bletchley to carry on the work which they had invented. Apart from the secrets of Enigma, it can be argued that the greatest contribution of the Allied victory made by the Polish Forces was in the field of military intelligence. The Polish Intelligence Service (PIS) formed the backbone of allied intelligence gathering operations in continental Europe and North Africa. In September 1939 the Polish Navy fought simultaneously in the Baltic and the North Sea, a destroyer flotilla having arrived from the Baltic in Britain on the day war broke out. At a time when the Royal Navy was desperately short of destroyers this was a welcome reinforcement. During the war this small but modern and efficient branch of the armed Forces covered 1,213,000 sea miles, helped cover 787 convoys, carried out 1,162 patrols and operations and sunk some 100,000 tons of enemy shipping. Ships of the Polish Navy took part in most major naval operations, including the defense of the Polish coastline, the sea battle of Narvik, the evacuation from Dunkirk, the raid on the Lofoten Islands, the sinking of the „Bismarck” (the ORP „Piorun” was the first ship to locate the German battleship), the Dieppe raid, the battle of the Atlantic, Mediterranean and Arctic convoys, and the D-Day landings. The Polish Navy during WW2 had 2 cruisers, 10 destroyers, 1 minelayer, 6 minesweepers, 2 gun boats, 8 sub­marines and 10 MGBs. The Polish Air Force, which though heavily outnumbered had fought with distinction above Poland in September 1939, was soon recreated in France, so that by June 1940 it numbered 7,000 personnel. The PAF added 56 German aircraft destroyed over the skies of France to those already destroyed over Poland in 1939. However, the PAF’s finest hour came during the crucial battle of Britain in which 145 out of 2928 pilots were Polish. The PAF was then concentrated in 302 and 303 Fighter Squadrons with indi­vidual Polish pilots flying with British squadrons. During this battle the PAF, which went into action only in late August, destroyed 130 of 1733 German aircraft destroyed (i.e. 71/2%}. The Polish contingent was the second largest after the British to take part in the Battle of Britain. During the war the PAF, operating from the UK, had four bomber squadrons one of which flew with Coastal Command and ten fighter squadrons (including one air to ground co-operation and one night fighter) and one artillery observation squadron. In all. since August 1940 the PAF flew 86,527 combat sorties, destroyed 500 enemy aircraft (in total during the whole war the PAF destroyed over 1,120 enemy aircraft). It destroyed 190 V-1 flying bombs, dropped 14,708 tons of bombs and mines and 12,084 aircraft were delivered by Polish pilots flying with Transport Command. A special unit delivering supplies to the resistance forces in occupied Europe, flew 2,747 operations of which 440 were over Poland. Though defeated and occupied the citizens of Poland did not accept their fate passively. Even before the last shots of the 1939 Campaign were fired a resistance army (In Service for Poland’s Victory) was being organized. This was shortly to become the Union of Armed Struggle which in February 1942 was renamed Armia Krajowa — the Home Army. Organized in cells, it encompassed the whole country and was active under both occupa­tions. Its main tasks were to make life for the occupying forces as difficult as possible, tying down enemy units, intelligence gathering and carrying out of military and industrial sabotage. The long term aim was to prepare for a general uprising at the moment of Germany’s defeat. The Home Army became occupied Europe’s largest and arguably most professionally organized and efficient resistance army. Countless sabotage operations against enemy transports and enemy industrial production forced Germany to maintain a large occupation force. Thanks to Home Army Intelligence, vital information about the V-2 rockets was made available to the Allies as were large parts of the rocket itself. The culmination of the Home Army’s operations was the 63 days long Warsaw Uprising in the summer of 1944, when for the second time during the war Poland’s capital continued a bitter and lonely fight in the name of freedom against the enemy. At its peak, the Home Army consisted of 300,000 soldiers excluding auxiliary civilian aid. In the east, units of the Home Army co-operated with Soviet forces in the liberation of Poland’s eastern cities such as Lwow and Wilno, only to be then forcibly disarmed, some deported to the USSR and many were murdered. Between 1941 and 1944, 316 Polish officers known as the „Silent and Unseen” (cichociemni), specially trained in Britain were parachuted into occupied Poland. Their mission was to act senior specialists either at Home Army GHQ, or at district command level and to carry out special assignments involving intelligence gathering and sabotage. The civilian side of this role also should not be forgotten. Poland’s Merchant Navy which considered of 58 vessels, displacing 213,903 BRT, played its part in keeping the lifelines open. In all they carried some 4,8 million tones of supplies for the Allies and thousands of troops. Vessels of the Polish Merchant Navy participated in the unsuccessful landing operations in North Africa, Sicily, Normandy and Southern France. It lost 15 vessels, a total of 60,332 BRT, with a loss of over 200 sailors’ lives. The Polish Peoples Army was composed of the many Poles who had been deported in 1939/1940 to Siberia and had not been able to reach the Polish Army in the USSR under Gen. Anders, before its evacuation. For them, this remained the only alternative way of getting out of Soviet imprisonment and fighting for Poland, albeit under the political aegis of a puppet communist regime made up of renegades and traitors loyal to Stalin, The nucleus of this army, the 1st ,,Kosciuszko” Infantry Division first saw action at the battle of Lenino in October 1943, suffering heavy casualties. The army grew in size mainly through conscription on Polish territories occupied by the Red Army. By April 1945 when the 2nd Army entered battle, the Polish Peoples Army consisted of: 1st Army, 2nd Army and 1st Armored Corps (in size smaller than the 1st Armored Division on the Western front). In all this force numbered some 400,000 troops of which half were on the front line in April. The 1st Army (part of 1st Byelorussian Front) took part in the forcing of the Vistula, the Pomeranian Wall (February 1945) and the capture of the important town of Kołobrzeg on the Baltic (8-18 March 1945). It then participated in the Beriin Operation, during which the 1st Infantry Division took part in the assault on Berlin itself. The Polish flag was hoisted above the Victory Column in central Berlin. Meanwhile 2nd Army (part of 1st Ukrainian Front) took part in the drive on Dresden reaching its outskirts, before having to repulse German counterattacks. It ended the war in operations towards Prague. The Polish People’s Air Force destroyed a further 11 enemy aircraft. Not counting the losses in the Polish 1939 Campaign (some 66,000 soldiers killed) and the underground Home Army the total casualties of the Polish Armed Forces an the West amounted to nearly 8000 killed, 11,000 wounded and 120,000 missing. Of necessity this is but a brief summary of Poland’s military contribution to the Allied cause in the Second World War It should be remembered that this was achieved despite Poland being a state in exile She managed to organize the fifth largest allied armed force, no mean feat in itself considering the lack of her natural economic and manpower base. Yet Poland’s contribution to allied victory was not limited to the role played by her soldiers, sailors and airmen. The civilian side of this role also should not be forgotten Poland’s Merchant Navy, consisting in all of 54 vessels, displacing 187,593 BRT tons, played its part in keeping the life lines open. In all they carried some 4.8 million tons of supplies for the Allies. The Polish Government in exile encouraged the growth of several Polish newspapers. Polish literature, academic writing and journalism flourished, as did theatres and war artists. Exhibi­tions on every conceivable theme were organized, helping to bring Poland’s culture and history closer to the allied nations, especially Britain. Poland’s diplomats and specialists in various fields played an active role in the debates and processes of the setting up of international agreements aimed at regulating the multitude of details for the post-war world. Of notable significance were the over 150 schools of all types set up in Britain, the Middle East, Africa and liberated Europe to enable Polish children to carry on their education. These included three university departments: architecture (Liverpool), medicine (Edinburgh) and law (Oxford). After 5 years and 8 months of war in which Poland had played an active part from the first to the last day, she emerged as the heaviest loser on the winning side. At Tehran in the autumn of 1943 Poland was handed over by her Western allies to Soviet rule. The Yalta conference only confirmed this act of betrayal For Poland and her people VE Day did not sound the bells of victory and a time of peaceful reconstruction. It ushered in a new foreign occupation, in which the new Poland robbed of half her territory annexed by the USSR, found herself under the Soviet heel. The struggle continued for a further forty five years until true independence was once more restored in December 1990. As a result of free and democratic election of Lech Wałęsa as President of the Polish Republic, the erstwhile President of Poland in Exile, Ryszard Kaczorowski and his government handed over the symbols of presidential office to Lech Wałęsa in a ceremony in Warsaw, thus ending the historic mission of the Polish State in exile. Polish Memorial in the UK. During the war and immediate post war years a plethora of commemorative tablets and memorials were unveiled in towns and churches where Polish were stationed. Many of these have survived to this day. After the war several major memorials were erected and unveiled to commemorate particular branches of the Polish Armed Forces or even individual units e.g. to the 1st and 2nd Armoured Regiments in Duns, Gen. Sikorski’s bust in St. Andrews. The best known of these memorials is that of the Polish Air Force in Northolt., West London, unveiled in 1948. In 1976 the Katyn Memorial was unveiled in Gunnersbury Cemetery, London, whilst in 2000 a statute of the Polish Prime Minister and C-in-C Gen. Sikorski was unveiled in Great Portland Street, London. There is a memorial plaque to the Polish Air Force In Westminster Cathedral, a Polish Air Force memorial in the RAF Church of St. Clement Danes and a plaque in St. Paul’s Cathedral. Mention should also be made of the Polish Navy memorial in Plymouth. In September 2009 a new large memorial commemorating the whole of the sacrifice and contribution of the Polish Armed Forced in the Second World War was unveiled by the Duke of Kent and at the National Memorial Arboretum in Alrewas near Lichfield, Staffs. The brainchild of three individuals, it was backed by The Polish Ex-Combatants Association which subsequently provided most of the funding. Representing the three branches of the Armed Forced and the Resistance Home Army, the memorial is surrounded by sixteen tablets providing basic information on the role and achievements of the Polish Armed Forces in the common Allied struggle against Germany during Second World War. It is the poignant to note that among those present at the unveiling ceremony were the last President of the Polish Government in Exile, Ryszard Kaczorowski, and the Reverend Bronisław Gostomski parish priest of St. Andrew Bobola in Hammersmith in London and chaplain to The Polish Ex-Combatants Association in Great Britain who blessed the foundation stone. Both were killed on 10 April 2010 in the tragic crash of the Polish presidential plane in Smoleńsk on their way to pay tribute to the 25 000 Polish regular and reserve officers murdered by the NKVD at Katyń and other places in the USSR.